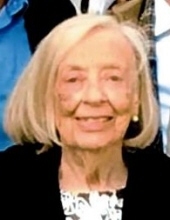 Bette Jean West, 91, passed away peacefully on April 14, 2019. She was born on January 14, 1928 to Anna Lee and William Robert Pope. She is survived by daughters Cheri (Steven) Wiggins, and Patti (David) Simpson; five grandchildren, and seven great-grandchildren. She was preceded in death by her husband Paul West. Bette was a long-time member of Journey Church (formerly Woodford Christian) and was a resident of Sayre Christian Village Friendship Towers. Her hobbies included bridge, reading, and refinishing furniture. She cherished family and faith and was loved by all who knew her. A funeral service will be held at 1:00 p.m. on Thursday, April 18, 2019 at Clark Funeral Home, Rose Hill. Rev. Randy Nation will officiate. Visitation will be Thursday from 11:00 a.m. until the start of the service at the funeral home. Serving as pallbearers are grandsons Robert Coleman, David Simpson II, Jeremy Simpson, grandsons-in-law Elijah Taylor, Thad Winter, and great grandsons Noah Coleman, and Jake Taylor. To send flowers or a remembrance gift to the family of Bette Pope West, please visit our Tribute Store. "Email Address" would like to share the life celebration of Bette Pope West. Click on the "link" to go to share a favorite memory or leave a condolence message for the family.